Data from Mexico’s 2010 census indicate that considerable progress has been made in the recent past. Literacy of those over age 15 has increased from 87.6% in 1990 to 90.5% in 2000 and 93.1% in 2010. This is to be expected since literacy varies with age. As the older people, many of whom are illiterate, die off, they are replaced by younger, more literate, Mexicans. For example, in 2010, 34% of those over age 75 were illiterate, compared to under 2% for those aged 15 to 29. Literacy is highest in the Federal District (97.9%) and lowest in Chiapas (82.2%), Guerrero (83.3%) and Oaxaca (83.7%). In future decades, illiteracy will continue to decline significantly, especially in the poorer southern states. However, with life expectancy increasing and older people living longer, illiteracy will not decline as fast as it might. About half of Mexican children aged 3 to 5 attended preschool in 2010. Basic education begins with primary schools (primaria) with grades 1 to 6 for children generally between the ages of 6 and about 12. Junior high schools (secundaria) cover grades 7 to 9 and focus on 12 to 15-year-olds. 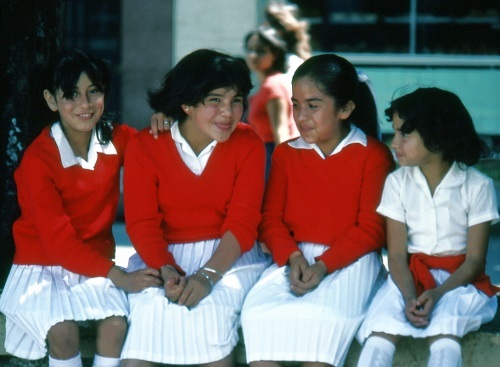 In Mexico primaria and secundaria are compulsory; however, in the past, many children dropped out for a wide variety of reasons (the need to work and support the family being a major one). Mexico’s telescundaria system brings junior high school lessons to students in remote areas via satellite. In 2010, an impressive 95% of those aged from 6 to 14 attended school, compared to 91% in 2000 and 86% in 1990. The majority of the 5% not attending school in 2010 did attend school previously and had acquired basic literacy. The rather poor state of Hidalgo had the highest attendance rate in 2010 with 96.4% (tied with Tlaxcala and the Federal District). The lowest levels were in Chiapas (90.8%), Michoacán (92.4%) and Guerrero (93.1%). The rather small difference between the highest and lowest rates suggests that most Mexicans throughout the country have relatively equal access to basic education. Even in the poorest 125 of Mexico’s 2442 municipalities 88% of 6 to 14-year-olds were in school, according to the 2010 census. Senior high school education (prepatratoria) offers grades 10 to 12 and is not compulsory. Students generally are aged between 15 and 18. Some of these schools focus on preparing students for university while others focus on vocational training. In some rural areas, students must travel considerable distances to the nearest senior high school, and some have to live away from home during term time. Unfortunately, school attendance is not a reliable indicator of the number of teaching hours. Students receive only 2.8 hours of real instruction per day according to a new study by Mexicanos Primero, a citizens’ group focused on improving the quality of education. The study indicates that Mexican students get 562 hours of instruction per year, compared to 710 hours in the USA, 875 in France, 1172 in Finland and 1195 in South Korea. Mexicanos Primero complains that too much real instruction time is lost due to preparation for parades and festivals, teacher absenteeism and school closures. There are also issues concerning the quality of education. According a recent Organisation of Economic Cooperation and Development (OECD) Mexico is doing a poor job of educating its youth. Only 1% of Mexican 15-year-olds have the knowledge and skills needed for full participation in modern society, compared to 30% in Hong Kong and 26% in South Korea. Higher education has made impressive gains. In 2010 over 40% of those aged 15 to 24 were attending school compared to 33% in 2000 and 30% in 1990. 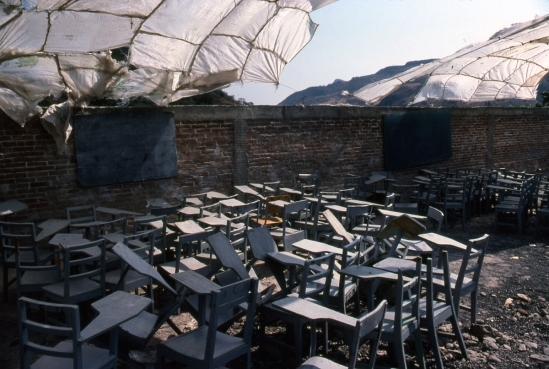 Temporary classroom while a new school is being built. (Jungapeo, Michoacán, mid-1980s). Photo: Tony Burton. The “average years of schooling” figure has increased about one year a decade, from 6.5 years in 1990 to 7.5 in 2000 and 8.6 in 2010. The Federal District is the most educated with an average of 10.5 years of schooling, compared to 6.7 in Chiapas and 6.9 in Oaxaca. Given historical trends, older adults have significantly fewer years of education than younger adults. There are still some serious urban-rural differences. The best educated municipality is Benito Juárez in the Federal District with 13.9 years, compared to levels between 2.3 and 3.4 years for the ten lowest municipalities, which are all in the rural south and are predominately indigenous language speakers. In these poor indigenous rural municipalities, most of the elderly have virtually no schooling even if the majority of children are now attending school and learning Spanish. INEGI: “Principales resultados: Censo de Poblacion y Vivienda 2010”, (presentación de resultados).